Central Washington University, or CWU, is a regional, comprehensive public university located on a 380-acre campus in Ellensburg in the US state of Washington. Founded in 1891, the university consists of three chief divisions include the Office of the President, Business and Financial Affairs, and Academic and Student Life (ASL). Within ASL are four colleges: the College of Arts and Humanities, the College of Business (Ellensburg campus and centers in the Puget Sound and central regions), the College of Education and Professional Studies, and College of the Sciences. CWU is located about 110 miles (180 km) east of Seattle, Washington on Interstate 90 in the Kittitas Valley. In addition to being the fastest growing public university in the state of Washington, CWU is considered an emerging Hispanic-Serving Institution with 15 percent Hispanic students. In 1890, the state Legislature established the Washington State Normal School (WSNS) in Ellensburg for “the training and education of teachers in the art of instructing and governing in the public schools of this state.”  WSNS originally opened on September 6, 1891, with classes held at the Washington Public School in Ellensburg. In 1893, the school's first building was constructed and named Barge Hall, in honor of the first WSNS principal, Benjamin Franklin Barge. Barge Hall was added to the National Register of Historic Places in 1976. In subsequent years, the university constructed additional campus buildings to accommodate a growing student body including: Kamola Hall (1911); Smyser Hall (1925); Munson Hall (1926); Sue Lombard Hall (1926); and McConnell Auditorium (1935). While Barge Hall’s architecture reflected a Richardson Romanesque style, the designs of later buildings incorporated elements of proto-Modernism along with Spanish Colonial Revival, Neo-Classical and Classical Revival styles. In the late 20th and early 21st centuries, as academic programs expanded, CWU saw construction of the Science Building I (1997); Black Hall (1998); the Student Union and Recreation Center (2006); Jerrilyn McIntire Music Education Facility (2007); Wendell Hill Hall and Mechanical Building (2008), Barto Hall (2012), Science Building II (2016), and the Samuelson STEM Center (2018). In 1937, the Washington Legislature authorized a name change to Central Washington College of Education. Reflecting the fact that the curriculum had expanded into areas of study in addition to teacher education, the school’s name was changed to Central Washington State College in 1961. It became Central Washington University in 1977. The on-campus location is established by a small residence hall, surrounded by the Student Union and Recreation Center and humanity facilities. The STEM and teaching facilities are located near the administrative buildings, which include Black Hall, Bouillon Hall, and the Science Building near Dean Hall (see map on right). Barge Hall and Mitchell Hall are where the primary administrative faculty are located. Admissions, Running Start, a Cashiers Office, the Registrar, and financial aid are all located in this area. This region is bounded by Samuelson Hall and living spaces Kamola Hall and Sue Lombard Hall. 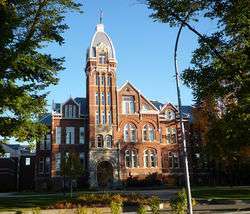 In addition to the residential campus in Ellensburg, Central Washington University has multiple locations around the state of Washington. The Pacific Northwest Geodetic Array (PANGA) uses real-time GPS measurements to research and measure crustal deformation and mitigate natural hazards throughout the Pacific Northwest. These hazards arise from earthquakes, volcanic eruptions, landslides, and coastal sea-level encroachment. In addition, PANGA GPS measurements are used to monitor man-made structures such as Seattle's sagging Alaska Way Viaduct, 520 and I-90 floating bridges and power-generation / drinking-supply dams throughout the Cascadia subduction zone, including the mega-dams along the Columbia River. GPS data are telemetered in real-time back to CWU, where they are processed in real-time using both JPL's RTG software as well as Trimble's RTKNet Integrity Manager software to provide relative positioning of several mm resolution. Wine Quality Research Initiative has identified the nature of wine faults in some wines and how to prevent them. Currently the initiative is directed at detecting and preventing wine fraud, a lucrative and growing crime in the wine import/export business. The Science Honors Research Program offers undergraduate students an opportunity to conduct high level research on projects that they design, develop, and implement. Map of Central Washington University as provided on website. CWU students, alumni, and varsity athletes are known as the "Wildcats" and their colors are crimson and black. CWU is part of NCAA Division II and is part of the Great Northwest Athletic Conference. USMC General James N. Mattis — United States Marine Corps. Commander of the United States Central Command 2010–2013. Class of 1972. Ron Sims — Current Deputy Secretary of the United States Department of Housing and Urban Development and former King County Executive. Astronaut Dorothy M. Metcalf-Lindenburger She was assigned to the crew of STS-131, her first expedition. United States Coast Guard Signalman First Class Douglas Albert Munro (October 11, 1919 – September 27, 1942) is the only member of the United States Coast Guard to have received the Medal of Honor, the U.S. military's highest decoration. Lieutenant Commander Craig Olson, Navy Blue Angels Demonstration #5 Lead Solo Pilot. A Boeing F/A-18E/F Super Hornet instructor pilot at Naval Air Station Lemoore,. Decorations include: Navy and Marine Corps Commendation Medal, three Navy and Marine Corps Achievement Medals, and various personal and unit awards. Christine M. Day, CEO of Lululemon Athletica an athletic sportswear company. Stephen L. Nelson, author of "Quicken for Dummies" and 150 other books in the series, over 5 million copies sold worldwide. Named "most prolific computer book writer" by Wall Street Journal. W. Hudson Kensel, historian of the American West. David L Boushey American Stuntman and the founder of the United Stuntmen's Association, the International Stunt School, the Society of American Fight Directors, and is a member of The Hollywood Stuntmen's Hall Of Fame. Daniel D. McCracken a prominent computer scientist. He was a Professor of Computer Sciences at the City College of New York, and the author of over two dozen textbooks on computer programming. Allan Byron Swift an Emmy award–winning broadcaster, served as a member of the United States House of Representatives from 1979 to 1995. He represented the Second Congressional District of Washington as a Democrat. Singer Wanz – featured singer on Macklemore and Ryan Lewis hit song "Thrift Shop (song)"
360° panorama of a portion of the Central Washington University campus as seen on an August afternoon. Taken at the southwest corner of campus, buildings, from left to right: Mitchell Hall, current location of most of the school's registrar and general admissions staff; McConnell Hall and auditorium, home of the Theatre Arts department; Barge Hall, financial and administrative center of campus; and Shaw-Smyser Hall, the primary building for the College of Business. On April 26, 2006, the school opened a $58-million Student Union and Recreation Center. The Student Union and Recreation Center is home to a full-sized rock-climbing wall, fully equipped gymnasium, and an outdoor recreation office, which rents everything from rafts, to snowshoes and ice axes. Margaret Coffin Holmes served as the Dean of Women for the Central Washington College of Education for 10 years. In addition to her service to CWU, Margaret was also a poet and writer, her published works included college ballads, tribute poems for her colleagues, a booklet of rhymes for children called “Out of the Sky”, a work called “Polmes by Holmes,” and editing of the Congressional Club Cook Book (the creation of which funded the mortgage for the Congressional club house). Margaret was married to Washington U.S. Congressmen, Hal Holmes. She is known for stepping in as a substitute for the main speaker and preparing a speech for the Congressional Club in 8 minutes flat. In 1960 Central Washington named the Grupe Conference Center, in Honor of Mary A. Grupe, who served at Central Washington during 1897–1907 and then again during 1912–1929. Mary A Grupe was born in Peabody Kansas in 1873. She attended the Oswego, New York Normal school, then went on to continue her education at the University of Chicago. She became a member of the Washington State normal school as an educator where she was head of the psychology department and a director of teacher training. Grupe also served a large purpose in the Ellensburg community as a member of the Governing Board of the Chamber of Commerce, as well as a member of the Ellensburg Park Board. Sarah Spurgeon was a professor of painting and drawing in the Department of Art at Central Washington University from 1939 to 1971. Upon her retirement in 1971, she received the honor of professor emeritus. Along with her contributions to CWU, Spurgeon was also a part of community projects such as creating the memorial panels that decorate the Ellensburg Community Pool. In 1977, the Sarah Spurgeon Gallery was put up in Randall Hall in honor of Spurgeon’s career at CWU. ↑ "Best Colleges 2014 – Central Washington University". U.S. News & World Report. Retrieved January 24, 2016. 1 2 3 "Central Washington University". College Navigator. U.S. Department of Education Institute of Education Sciences. ↑ "Central Washington University". College Atlas. Retrieved August 31, 2016. ↑ Redinger, Jade (September 28, 2015). "Yakima Valley Community College and Central Washington University receive a $3.25 million federal grant to support enrollment and transfer". KVEW-TV. Retrieved August 31, 2016. ↑ Mohler, Samuel M (1967). The First 75 Years: A History of Central Washington State College (PDF). Spokane, WA: Central Washington State College. pp. 5–6. ↑ "Student Accounts | Contact Us". www.cwu.edu. Retrieved 2016-03-10. ↑ "About CWU | CWU Campus Locations". www.cwu.edu. Retrieved 2016-03-10. 1 2 "Central Washington University". NCAA. Retrieved 28 October 2012. 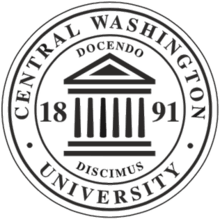 ↑ "Central Washington University". US News & World Report. ↑ "Player Bio: Keith Gilbertson". Gohuskies.cstv.com. Retrieved 2010-01-18. ↑ "Miesha Tate UFC Bio". Retrieved 2014-01-01. ↑ "Bryan Caraway UFC Bio". Retrieved 2014-01-01. ↑ "Matt Hume MMA Bio". Retrieved 2014-01-01. ↑ "Benton County treasurer sets sights on the state job". Tri-City Herald. Retrieved November 9, 2016. 1 2 Morrison, Sid (September 8, 2012). "Op-ed: State has gone from passing to failing on higher education in past 50 years". The Seattle Times. ↑ "Astronaut Bio: Dorothy Metcalf-Lindenburger (06/2010)". Jsc.nasa.gov. 1975-05-02. Retrieved 2012-08-20. ↑ "LCDR Craig R. "Merlin" Olson – #5 Lead Solo". Retrieved 12 October 2012. ↑ Lohr, Steve (August 12, 2011). "Daniel D. McCracken, Expert on Computers, Dies at 81". New York Times. ↑ "TV.com – Craig T. Nelson Biography". Tvguide.com. Retrieved 2010-01-18. 1 2 3 (1961, Nov. 15). Writer of children's poems. Ellensburg Record. Library Department Faculty Information (Files Box 1, Folder 34), Brooks Library Archives & Special Collections, Ellensburg, W.A. ↑ (1945, Aug 24). Mrs. Hal Holmes Helps Edit Congressional Club Cook Book. Ellensburg Record. Brooks Library Archives & Special Collections, Ellensburg, W.A. ↑ (1942, April 9). Public Speaking Is Easy Task For Wife of New Representative. Washington Post. Brooks Library Archives & Special Collections, Ellensburg, W.A. ↑ "Faculty Senate | CWU Faculty Center to Open Fall 2013". www.cwu.edu. Retrieved 2016-03-05. ↑ Fowler, S. (1930, January). In Memory of Mary A. Grupe. Washington Education Journal. Library Department, Faculty Information File (Box 1, Folder 27), Archives & Special Collections, Brooks Library, Ellensburg, WA. ↑ "Art | Sarah Spurgeon". www.cwu.edu. Retrieved 2016-03-05. 1 2 3 Unveiling of Memorial Panels Completes Pool. Faculty Papers (Sarah Spurgeon Scrapbook), Archives & Special Collections, Brooks Library, Ellensburg, WA.